Financial Data Analysis…Hands Down, Worst Holiday Tradition Ever. Like most families, the Kellers have a host of holiday traditions that make this time of year special. There's the annual trek to get our family Christmas tree. Christmas decorating that is sure to include some inflatable eyesore. Family holiday movie nights. Christmas plays. Our visit with Santa (followed by the endless threats to have him withhold a gift of our choosing). Impromptu parties with family and friends. It’s pure magic. I really do love the holidays. Sadly, all of these joys are quickly followed by the worst holiday tradition ever: the dreaded Keller Family Financial Review. My husband, of course, loves this yearly tradition...for the same reason, I’m assuming, I love to run until my hips, knees and ankles hurt. Because each of us, in our own way, is a masochist. So, each year, right after Christmas, the spreadsheets and graphs from our data analysis emerge from the office. And, despite my pleas, we reflect. 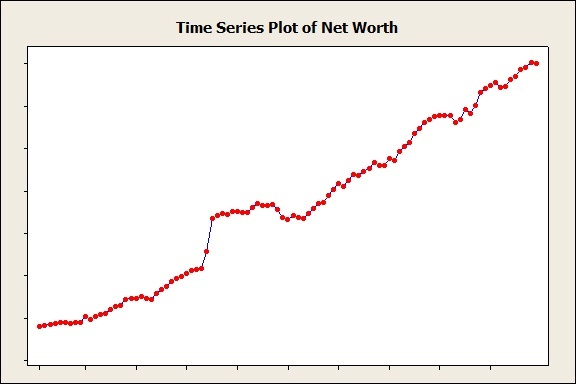 We, of course, evaluate our net worth. This seems especially interesting to my husband, having been raised by a CPA. Our goal, I suppose, is for it to continue to increase. So, each year, we evaluate a chart like the Time Series Plot below and he provides his evaluation of our status. Better than expected? As expected? This chart, while valuable, rarely makes me lose sleep. I didn’t grow up with all of the niceties of a CPA’s kid so, quite frankly, it’s going to take a lot to shock me. The next chart, on the other hand, usually sends me into a spiral of self-hate and despair. 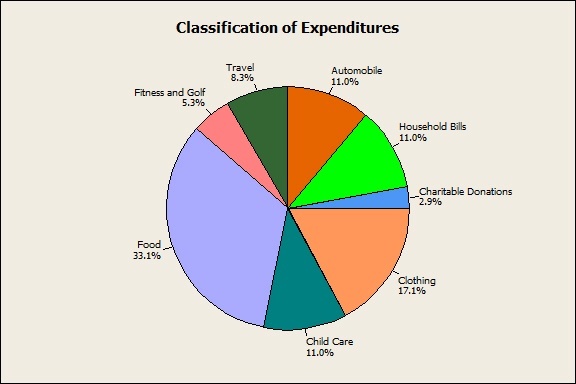 The Classification of Expenditures Chart is where we evaluate how we’ve spent our money. Let me start by saying that we try very hard to raise our children to understand the value of giving back rather than focusing on the “things” we accumulate. We volunteer and raise money for children’s charities. My daughter writes and sells book to support the Janet Weis Children’s Hospital. We talk about how fortunate we are and how we should never take that for granted. We don’t seem like horrible people, right? Right? Wrong. Each year, out comes the Classification of Expenditures Chart that inevitably makes us question whether we should be raising kids at all. Hence, the hate and despair. Notice below. How could we have possibly spent more on fitness and golf memberships than we gave to charities? What types of people do that? We are horrible, horrible human beings. It’s a horrifying spiral. But I was not going to let it happen again. This year, I decided to head it off. Much to my husband’s surprise, I requested a pre-holiday evaluation of expenditures. I would not sit through another spiral of self-hate and despair. And what did I find? Well, sure enough, we spent more on fitness and golf memberships…again. My running gear and personal training sessions? That is an important investment in my health and well-being. But my husband’s golf memberships? That just seems like pure self-indulgence. And so, I pulled out the Keller Family Checkbook to make things right in this world. We will not go through another year as horrible, selfish people! We are giving back more than we golf or run! The Keller family is excited to support the ThinkBig! Pediatric Cancer Program at Janet Weis Children’s Hospital this year. It’s a great program that is led by an amazing group of doctors and nurses. And, to make things right at the Keller Annual Financial Review, they’ll be receiving their first donation a little earlier than planned. And, just like that, we’re able to look our children in the eyes as we talk about the importance of giving during the holiday season. Here’s to a year free of self-loathing and hatred! Until, of course, the actual Keller Family Financial Review. My husband has indicated that we’ll be discussing the clothing expenditures. Geesh.